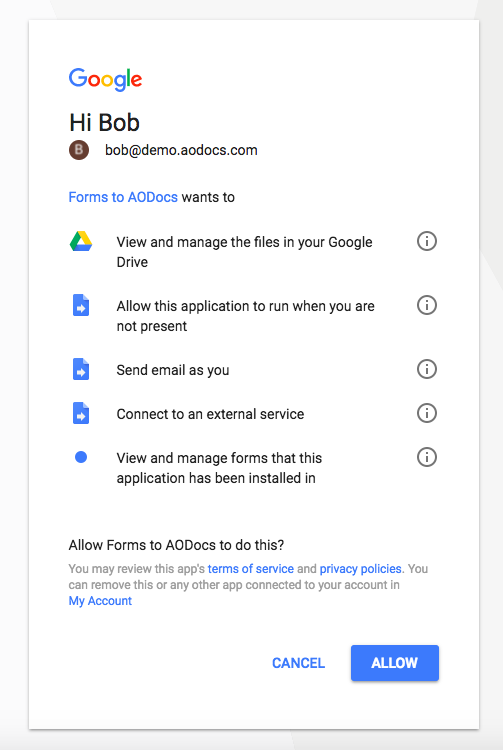 - To install Forms to AODocs, your G Suite administrator must have authorized you to install add-ons on your G Suite domain. - You must be an AODocs library administrator to install and configure Forms to AODocs. 1. 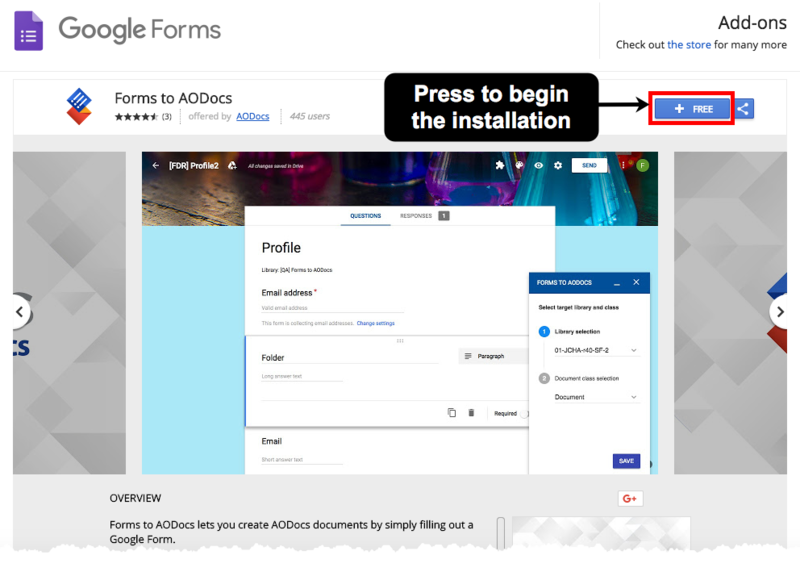 Go to Chrome Web Store and install Forms to AODocs. 2. The add-on initializes and asks you to grant permissions to Forms to AODocs on your account. Press Continue to open the permissions page. 4. 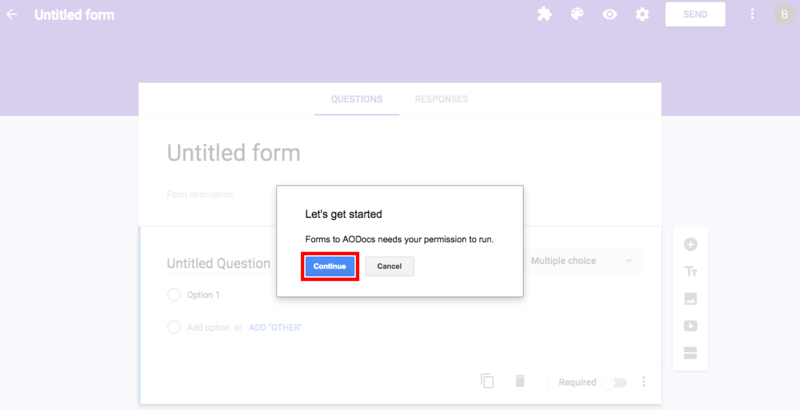 The add-on is now installed and you are ready to configure your first Google Form linked to an AODocs library. When you install Forms to AODocs, you are asked to grant some permissions on their G-Suite account. View and manage your files in Google Drive It allows the add-on to import file attachments from your My Drive (where files uploaded by form respondents will end up) to AODocs. It allows the add-on to store configuration data necessary to import form responses. Allow this application to run when you are not present It allows the add-on to process user responses even if you are not connected. Send email as you It allows the add-on to warn you when the form submission feature encounters a problem. Connect to an external service It allows the add-on to reach to AODocs and to import the document. 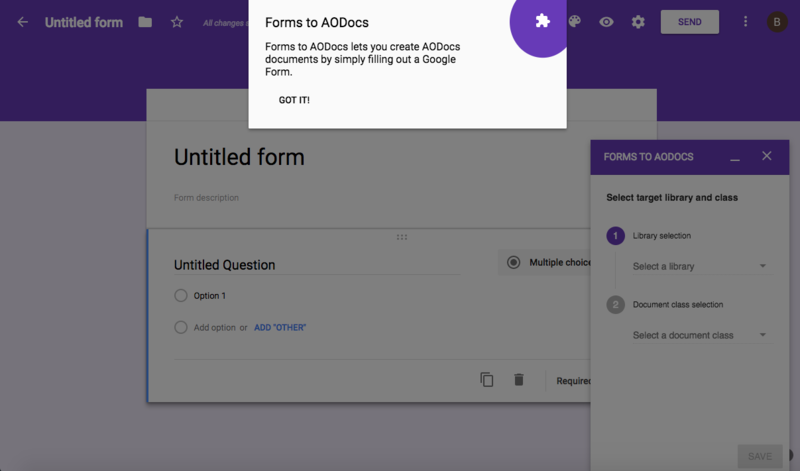 View and manage forms that this application has been installed in It allows the add-on to collect info about the questions and answers of your Google Form.